Yesterday, Elon Musk reconfirmed on twitter that the Model 3 will have a bigger trunk lid thus allowing to fit larger items in the trunk. However he did reveal any details in terms of dimensions. Some Model 3 reservation holders and enthusiasts were hoping the car will have similar trunk lid as the hatchback rear door of the Model S sedan. Guests who were present to at the Model 3 unveiling and test drove the car were able to show a glimpse of the early design of the trunk. 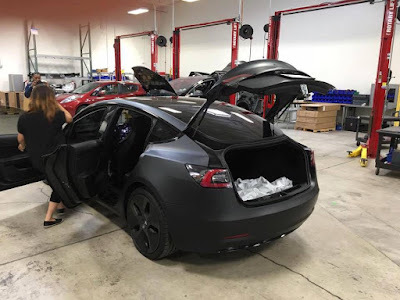 Recently, new pictures emerged of the Model 3 prototype in matte black driving around Tesla's HQ in Palo Alto whereyou can see a better view of the trunk lid which bares resemblance to the original design during the unveiling suggesting there has been no actual modifications yet on future alterations. 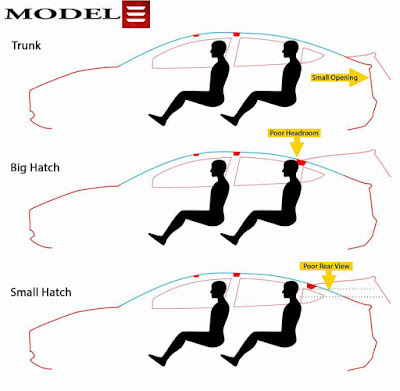 Shortly after the unveiling of the mass market EV, Elon Musk went on twitter to take some Q&A's, he explained the reason behind the lack of a hatchback door on the Model 3 was to make more headroom for the rear passengers thus moving the rear roof cross-car support beam more to the back. However, he reiterated the back seats will be able to fold completely down thus making room to fit large objects such as a bike. Later in April, he confirmed that Tesla is working on making the trunk opening bigger, probably due to customer feedback. Back in early June, Elon Musk confirmed during Code Conference that Tesla is aiming to finalize Model 3's design by mid July. Any potential alterations afterwards will have to wait for future versions of the vehicle. The following illustration below demonstrates what he was referring to. 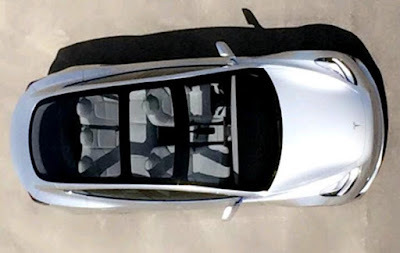 Here is a recently aerial view, from Motor Trends, of the Model 3's panoramic glass roof allowing the rear passengers to have a sense of openness in the back. Wouldn't the small hatch block all view in the rear view mirror? They will probably try to make the opening bigger but I belive they will keep it as a trunk.